READ AND ENJOY LANGUAGE AS LUSH AS THE MOST EXPENSIVE FABRIC! Since I’ve been bad and didn’t prepare a post for today, I’m going to subject you to an excerpt from my WIP. I’ve signed a contract with The Wild Rose Press on Sinners’ Opera, the book of my heart. Sinners’ Opera is Morgan’s story. He’s my favorite hero. 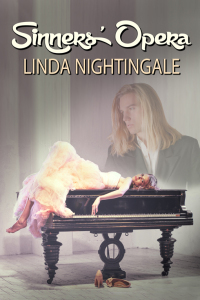 He’s a classical pianist, an English lord…and a vampire. Sinners’ Waltz is the prequel to Sinners’ Opera. I’m waiting for the rights on the sequel (Sinners’ Obsession) to revert to me, and it, too, will go to TWRP. Sadly, with the re-release, this cover will no longer be used. My son did this for Double Dragon Publishing at the time of first publication. If I have writer’s block, most often, I can write something in Morgan’s POV.